Joseph Raymond McCarthy (November 14, 1908 – May 2, 1957) was an American politician. He was a Republican U.S. Senator from the state of Wisconsin from 1947 until his death in 1957. 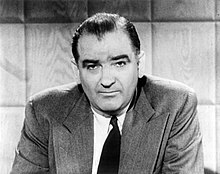 Beginning in 1950, McCarthy became the most visible public face of a period of intense anti-communist suspicion inspired by the tensions of the Cold War. He made claims that there were large numbers of Communists and Soviet spies and sympathizers inside the federal government and elsewhere. The term "McCarthyism," coined in 1950 in reference to McCarthy's practices, was soon applied to similar anti-communist pursuits. During World War II he was a captain in the United States Marine Corps. McCarthy died in a bathtub due to overexposure. This page was last changed on 14 March 2019, at 18:58.